Welcome to Day #2 of the First Sale Sprint Challenge! Today we cover additional steps needed in order to be successful with Shopify drop shipping. Today we cover something that most drop shippers struggle with early on. In fact, this may very well be the most impactful post of the entire series for you. We talking of course, about winning product selection! There are 6 primary methods we utilize when it comes to identifying high converting products. And we’ll be thoroughly explaining each in just a moment as we choose 1 product using each method. Strap in, today is a big day! It’s important to track each of the products you add to your store. 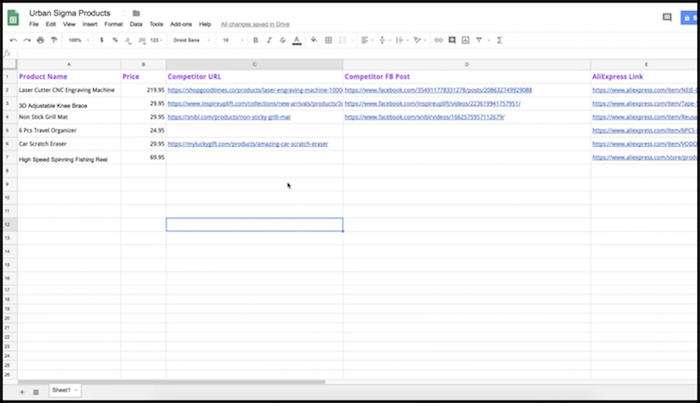 We personally utilize a free Google Doc, as you’ll see in the image above. This helps your organization tremendously, especially as your Shopify store continues to grow. Install Oberlo and connect your MailChimp email account. MailChimp is free until you reach your first 1,000 subscribers. Oberlo is a Shopify App that allows you to (nearly) automate product imports, order placing and fulfillment. While Oberlo isn’t quite as powerful as ZeroUp (the paid alternative) in terms of features and functionality, it’s a viable option when ZeroUp is out of your price range. You’ll still be required to manually tend to certain tasks with Oberlo. But that’s ok, because once you begin seeing 20+ daily orders, we suggest hiring a Virtual Assistant. 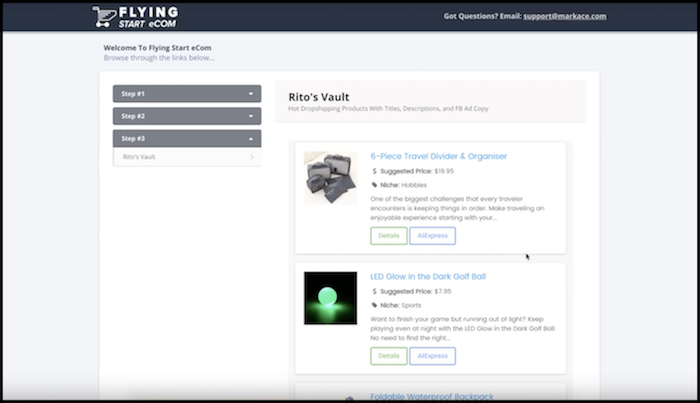 When you incorporate this simple, user-friendly tool into your eCommerce business, you’ll immediately alleviate time consuming product selection and figure out winning ad sets to promote those winning products. But you’ll discover the exactly where the product is selling, the images being used, the copywriting implemented and the headlines selling them. Pexda has proven to be an invaluable resource for our drop shipping endeavors. For UrbanSigma, we’ve chosen a CNC personal engraving machine to sell as a high ticket item. 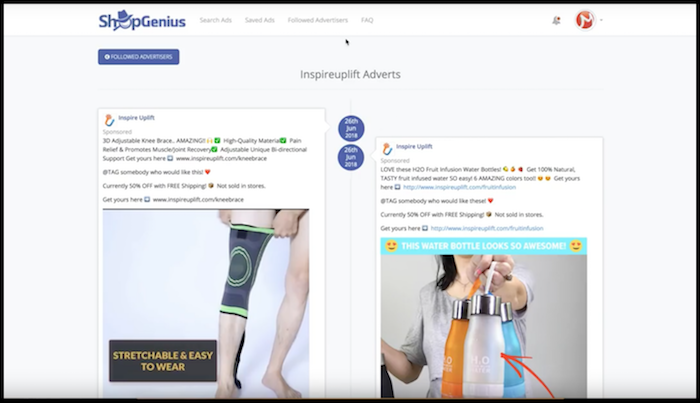 Similar to Pexda, ShopGenius is a Facebook ads research tool that offers real time spying without the worry of non compliance associated with other solutions! You can actually try ShopGenius RISK FREE and Save $30 dollars per month with our special launch offer. This is a Facebook approved solution for eCommerce businessed who need an edge. ShopGenius is much easier to use than other competitive research tools we’ve used in the past and has become our go-to resource for identifying winning products. One of the coolest features offered by ShopGenius is the ability to follow certain FB advertisers. So if you’ve noticed somebody doing it right, you can follow them and keep track of every single product they promote and how they do it. This is Shopify drop shipping espionage at its finest! With this method, we’ve chosen to add a 3D Adjustable Knee Brace to Nigel’s store. 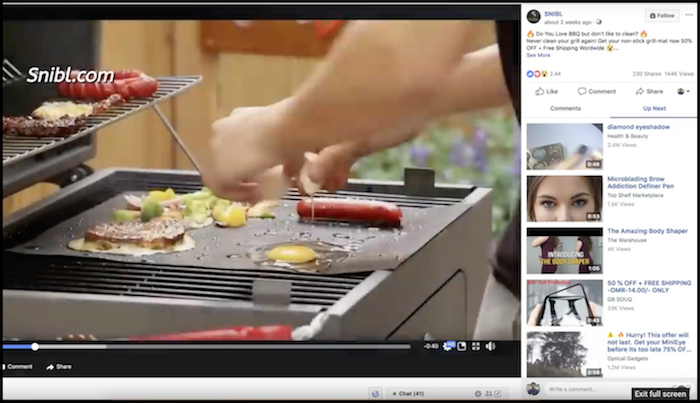 Now focus on identifying product videos with high amounts of recent shares and comments. This method is available exclusively to our DOer Group Members. Each day Rito add proven winning products to the vault for you to utilize. These are all products that we have personally tried, or plan to in the near future. We’ll do a deep dive into this method in a future post. For now all you need to know if that we remove the guess work and reveal products that are crushing it. Basically, what this company does is catalog Shopify stores, and arrange them from most to least popular. You typically won’t want to utilize the most popular stores for product ideas as those will be the most saturated. We’ll typically scroll to the 4th, 5th and 6th pages of results and attempt to identify drop shipping stores from the list. Once we’ve identified a popular, well built drop shipping store from the list, we’ll proceed to investigate their best sellers. But in order for us to identify their best sellers, we needed to search the following specific URL which allows you to reveal an updated list of best sellers for any Shopify store. We can now see which products are converting well for this particular store. Using this method, we’ve decided to add a Car Scratch Eraser to Nigel’s site. 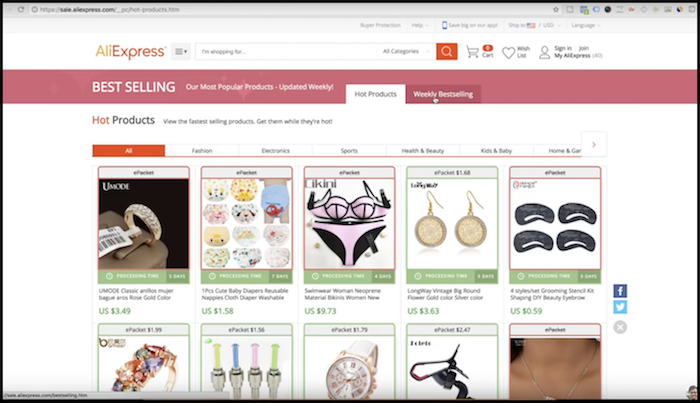 When you visit any product page on AliExpress you’ll notice suggestions, keywords and related items because they want you to make a purchase. If you know what to look for, certain aspects of AliExpress reveal products likely to perform well for your own store. Once upon a time AliExpress had a link on their homepage to their real-time best sellers. That link has long since been removed. Fortunately there’s still another way to reveal AliExpress best sellers. When you are perusing best selling products on AliExpress, you’ll begin by selecting a product or category like an iPhone case, “Outdoor” or “iPhone” and go from there. Once you click on a product you’ll be taken to the store listing page, instead of the actual AliExpress product listing. For our strategy to work, you’ll need to access the actual product listing. To the left of this “.hmtl” portion of the URL, you’ll see a number coming after an underscore – copy that number up to the underscore. 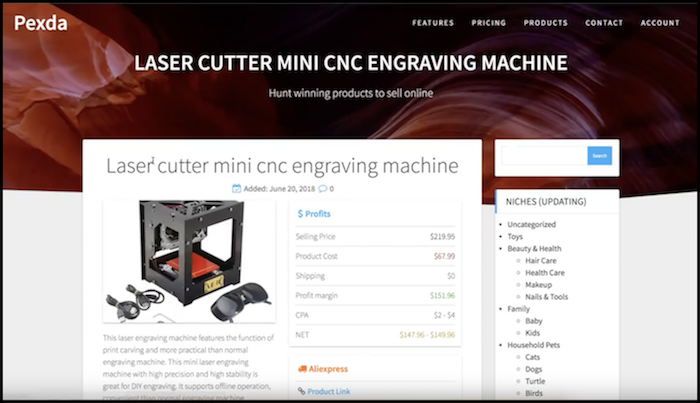 You’ll now be able to see the true AliExpress product listing page which reveals best sellers from that particular vendor, top selling highly related products, and that particular product’s category bread crumbs. Our favorite part of this “Rabbit Hole Technique” is the Related Search Terms provided at the bottom of the product listing page. 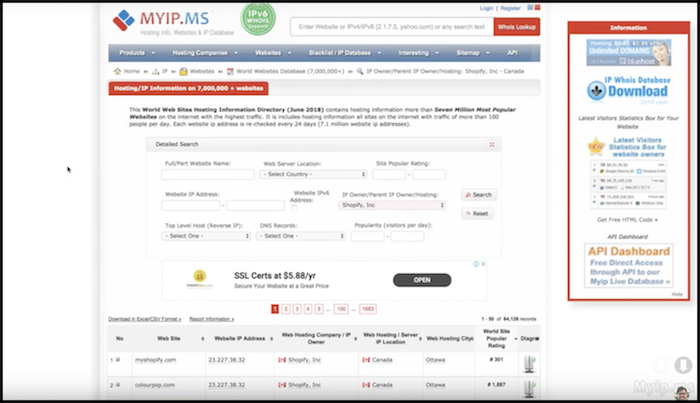 You now have insight into the exact products people are searching for and can add items to your website accordingly. That’ll do it for Day 2 of the First Sale Sprint – Well done! P.P.S. Click here for Day 3! 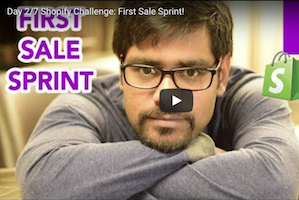 « Day 1/7 Shopify Challenge: First Sale Sprint!